CONCORD, N.C. – First time winners across multiple divisions highlighted a fender-bending Tuesday night of exciting Bojangles’ Summer Shootout racing at Charlotte Motor Speedway, as five drivers scored their first Shootout wins in their respective divisions on the frontstretch quarter-mile, with four of those being first-timers in any division in the series. No stranger to success in the world’s ultimate grassroots racing experience, Carson Ferguson set a blazing pace in scoring an impressive victory in the In Light Wellness Legend Car Pro feature. The number on the sides of Ferguson’s No. 00 machine represented the number of drivers who could keep up with Ferguson in the feature, as he led 24 of 25 laps on his way to victory. The win was Ferguson’s first in the Pro class and his 22nd career Shootout win overall, after capturing nine Bandolero Bandits wins during the 2010 and 2011 seasons and adding 12 Legends Car Young Lions wins from 2013-2014. Stevie Johns Jr. and Chase Purdy were relegated to second and third after a stirring battle to the checkered flag. 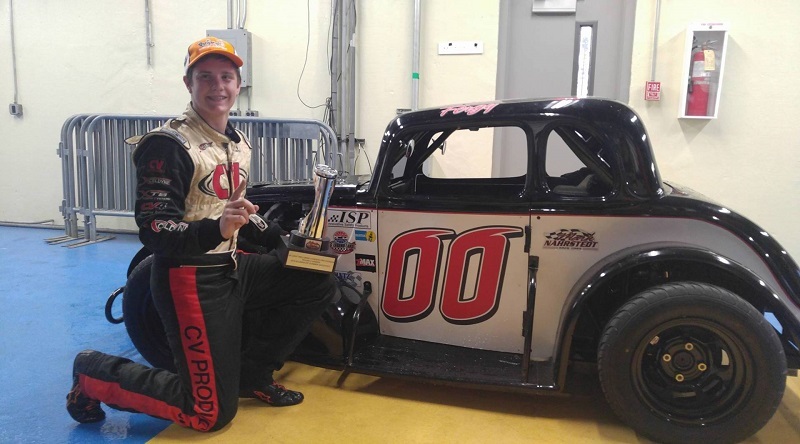 Scott Joy, the son of NASCAR on FOX analyst Mike Joy, captured his first AAA Carolinas Legend Car Semi-Pro victory over Tyler Truex in an exciting feature finish. The K1 Speed Young Lions finished out the night with a nine-lap battle wrought with cautions. Ashton Higgins led the early portion of the race but ultimately a slew of cautions left him stuck in the middle of the pack, while Braden Langille – who made the trip down from Canada – ended up on top as a first-time winner as well. The Legend Car Masters feature saw Bruce Silver set the pace at the green flag with Carl Cormier, Todd Midas, and Mark Green following close behind. Midas took first place away on Lap 2 and built a consistent two car-length lead. Green battled with Bruce Silver for second and third, and with 20 laps to go, Carl Cormier spun on the back straightaway to bring out the only caution. Midas quickly took his place in first, leading the field the rest of the way with Mark Green and brother David following him to the finish. Other winners on the night included Stanley Hayes in the Beginner Bandolero Bandits feature, Josh Kossek in Bandolero Bandits and Tristan Lesik in the Bandolero Outlaws. Hayes and Lesik were both first-time Shootout winners.